Denagamage Praboth Mahela de Silva Jayawardene , known as Mahela Jayawardene, is a professional Sri Lankan cricketer and a former captain of the Sri Lankan cricket team. He is a specialist batsman. Jayawardene made his Test cricket debut in 1997 and his One Day International (ODI) debut the following season. In 2006 he made the highest ever score by a Sri Lankan in Test cricket, scoring 374 in the second Test of Sri Lankas home series against South Africa. He has a test cricket average of over 50 and a One Day average in the 30s. He is the first player in the history of Sri Lankan cricket to score over 10,000 Test runs. Despite his relatively low ODI average, Jayawardene is considered to be one of the best batsmen produced by Sri Lanka and is generally held in high regard as a legend of the modern game along with team-mate Kumar Sangakkara. He is one of only three Sri Lankans—the others being Sanath Jayasuriya and Sangakkara—to have scored more than 10,000 runs in ODIs. Along with teammate Sangakkara, he recorded for the most partnership runs for the 3rd wicket in Tests, scoring 5890 runs surpassing 5826 run stand of Rahul Dravid and Sachin Tendulkar, during the first test match against Pakistan at Galle International Stadium, which was his last test at the venue. He scored 56 runs at that match, where his counterpart scored 221 runs. Jayawardene was a key member of the team that won the 2014 ICC World Twenty20 and was part of the team that made to the final of 2007 Cricket World Cup, 2011 Cricket World Cup, 2009 ICC World Twenty20 and 2012 ICC World Twenty20. In 2006, Jayawardene was named by the International Cricket Council as the best international captain of the year and he was nominated in 2007 as the best Test cricket player of the year. He is also known for his fielding skills in the inner ring, with a report prepared by Cricinfo in late 2005 showing that since the 1999 Cricket World Cup, he had effected the most number of run-outs in ODI cricket of any fieldsman, with the fifth highest run-out/match ratio in ODIs. Statistics also reveal that is the most common bowler-fielder combination in the history of Test cricket. Jayawardene was educated at one of the most prestigious schools of Sri Lanka, Nalanda College Colombo. At early age Mahelas father, Mr Senerath Jayawardene introduced him to Lionel Coaching Clinic run by Nondescripts Cricket Club in Cinnamon Gardens. It was there that he learned to play cricket. Mahela captained Nalanda College Colombo first XI cricket team in 1994. He developed his talents through the school cricket team, eventually becoming captain. He was runner-up for the best schoolboy cricketer award during the 1994 cricketing season. Domestically he has played for Sinhalese Sports Club since 1995. He was signed to play as an overseas player for Derbyshire for the first half of the 2008 English cricket season. However, his commitments to Sri Lanka and involvement in the Indian Premier League prevented him from playing any part in the 2008 county season. Jayawardene was the captain of the Sri Lankan national team during the England tour in 2006 in the absence of Marvan Atapattu. He led his team to 1–1 draw in the Test series and an emphatic 5–0 whitewash in the ODI series. However, he regained some form during the IPL 2010. Before starting their chase of 201 runs against Kolkata Knight Riders, Jayawardene expressed his desire to open the innings to captain Kumar Sangakkara. Sangakkara agreed to his fellow countrymate and Jayawardene scored a blazing 110* off just 59 balls winning them the match in the second last over. Sangakkara, impressed my his teammate set him as opener for the Kings XI Punjab. He scored a few more entertaining knocks in vain including 44 against the Rajasthan Royals and 93* against the Deccan Chargers. He ended the tournament with a batting average of 43.90. He was the 6th highest run scorer for the tournament and highest for the Kings XI Punjab. 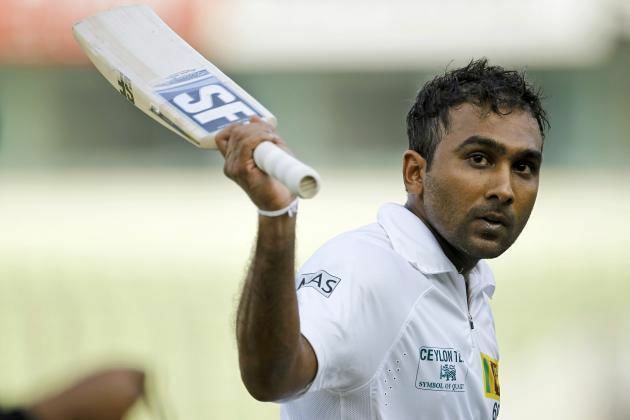 Mahela was born to Sunila and Senerath Jayawardene at Colombo in 1977. He had one younger brother, Dhishal who died of a brain tumour, aged 16. This affected Jayawardene psychologically, halting his cricket career for some time. Eventually he was persuaded to go on and set about rebuilding his career by his parents and teammates. He is married to Christina Mallika Sirisena, a travel consultant. The two have one daughter.